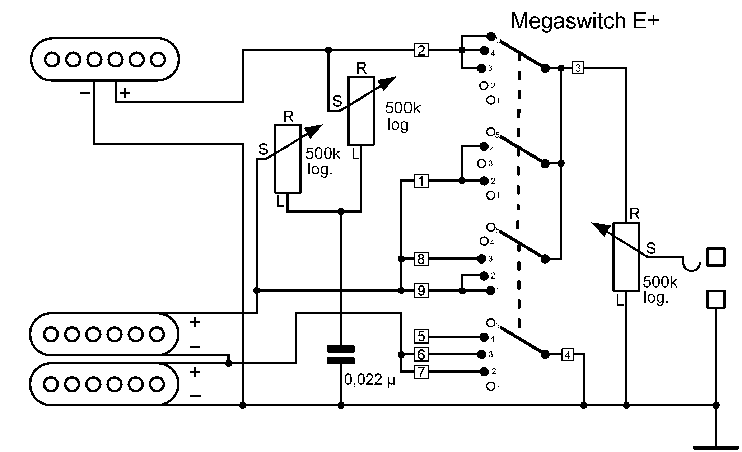 This is the simplest switching system for guitars with a Humbucker on the bridge and a single coil on the nick. The switch has 3 positions and operates the bridge, both parallel and the neck . Each one has its own tone control. The Megaswitch T is ideal for this purpose. 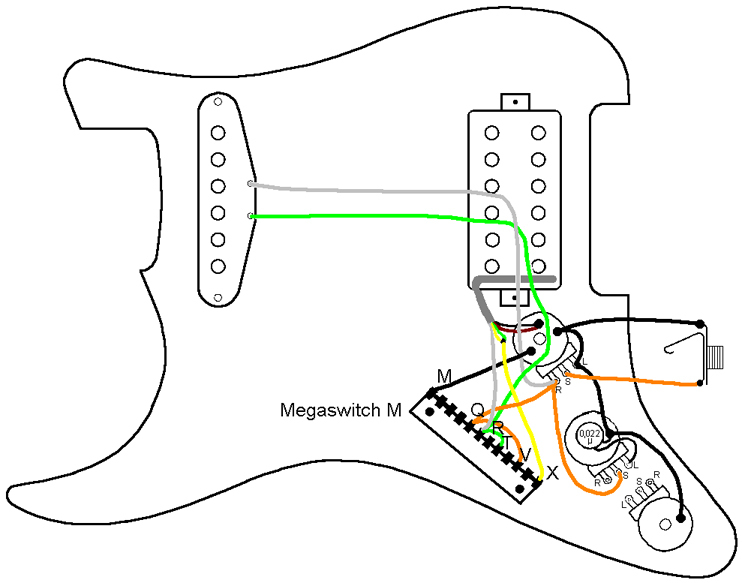 This switching system is for guitars with a Humbucker on the bridge and a single coil on the neck. It allows the humbucker to be split while the outer coil remains active. The inner one is short-circuited . If a buzz-free sound is desired in position 3, the magnetic polarity must be NS-S or SN-N. A Megaswitch E+ is required here. 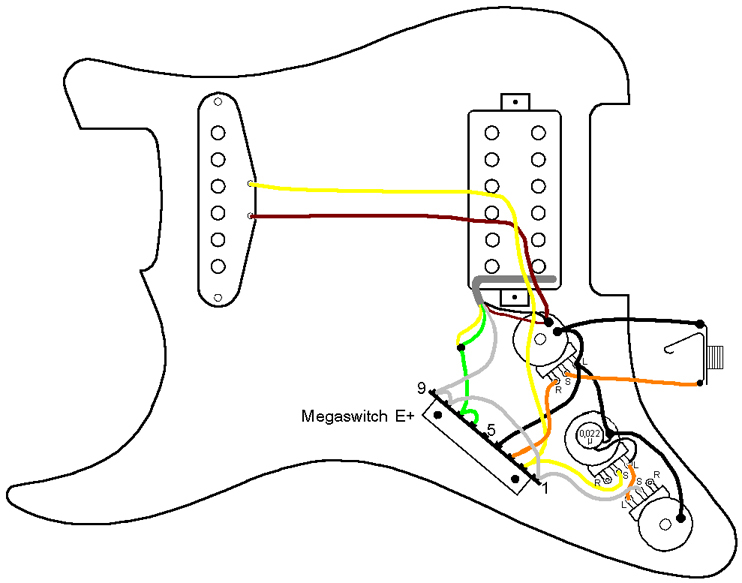 This switching system is for guitars with a Humbucker on the bridge and a single coil on the neck and allows the Humbucker to be split while the inner coil remains active. The outer coil is short-circuited. When a buzz-free signal is required in position 3, brummfrei sein soll, the magnetic poliarity must be either NS-N or SN-S. A Megaswitch E+ is required here. 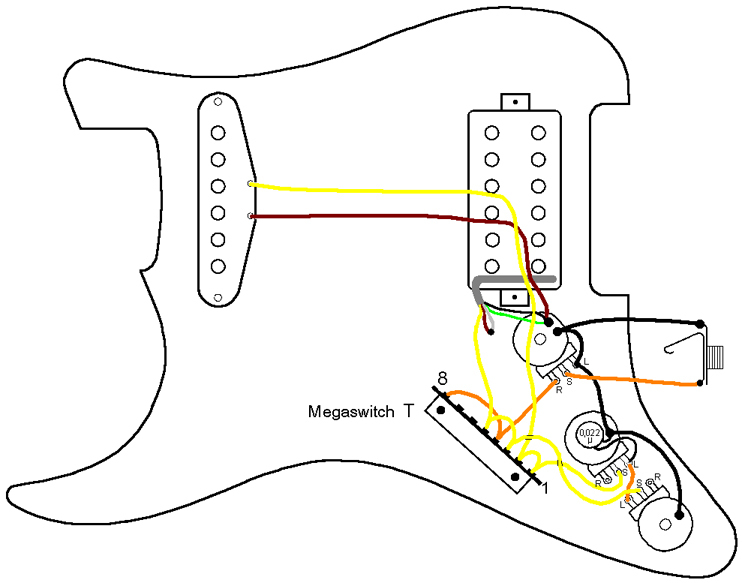 This switching system is for guitars wiht a Humbucker on the bridge and a single coil on the neck and allows both pickups to be switched in series which creates a lowder, fuller sound. Here, the Humbuckers can be split while the outer coil remains active. The inner coil is short-circuited. If a buzz-free sound is required in position 4, the magnetic polarity must be either NS-S or SN-N. The neck pickup has to be a symmetrical type, as in Figure 1 or Figure 3 in the introduction, i.e. the wire windings should not be connected to a metal cap. 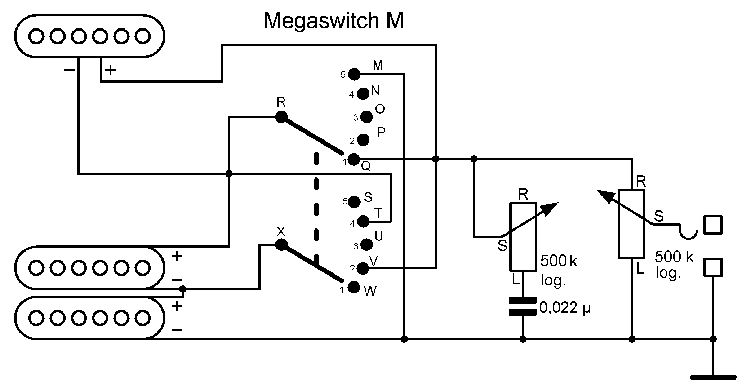 Here, the Megaswitch M is used. 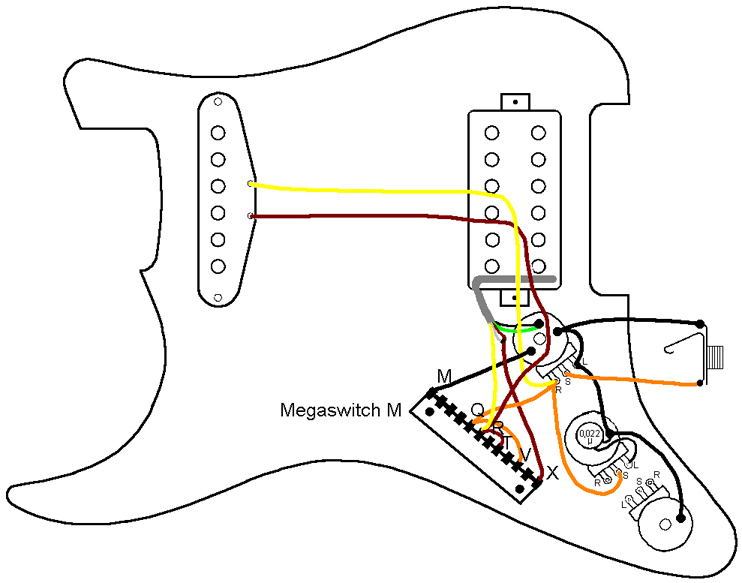 This switching system is for guitars with a Humbucker on the bridge and a single coil on the neck and allows both pickups to be switched in series, which creates a louder, fuller sound. Here, it is possible to split the Humbucker, while the inner coil remains active. The outer coil is short-circuited. 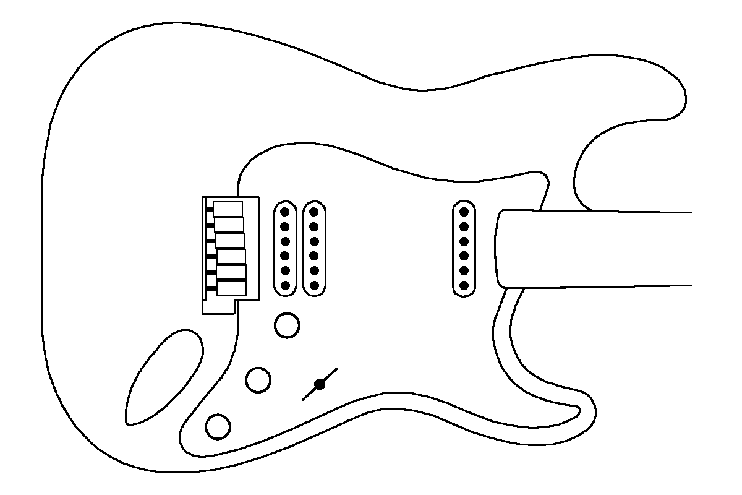 The neck pickup has to be a symmetrical type such as in Figure 1 and 3 in the introduction, i.e the wire windings may not be connected to a metal cap. 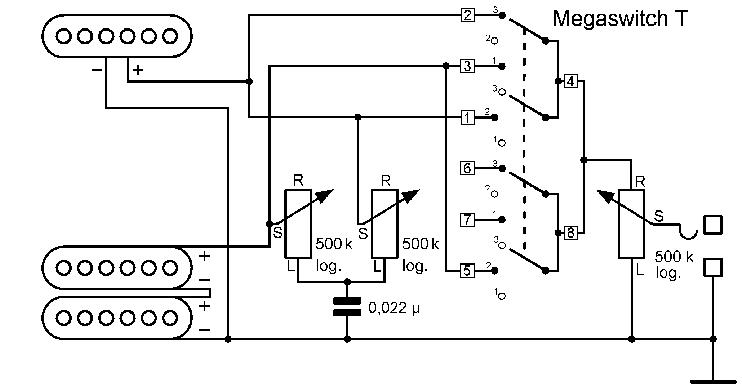 If a buzz-free sound is required in position 4, the magnetic polarity must be NS-N or SN-S. 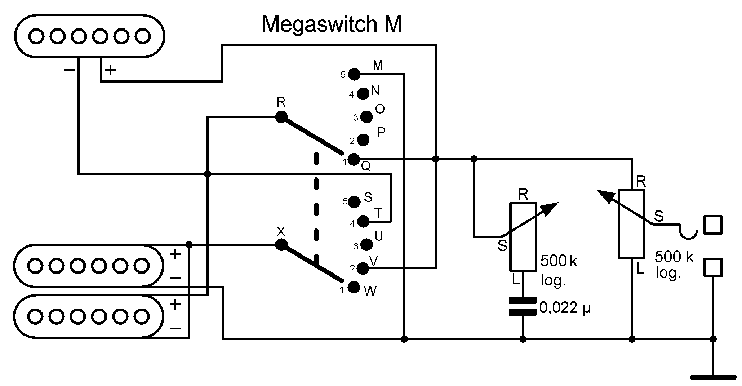 Here, a Megaswitch M is used.